The Nissan GT-R is clearly quite a car. The kind of car that's built with such obsession that its tyres are filled with nitrogen so they don't suffer excessive pressure change when they get hot. The kind of car that has an engine hand-built in a hermetically sealed room to ensure absolute precision and cleanliness. The kind of car that got Jeremy so excited he was prepared to fly all the way to Japan to drive it. Unfortunately, Richard and James insisted on tagging along too, so the Top Gear office came up with a very special race. Could Clarkson in his technofest Nissan get from one side of Japan to the other before Hammond and May could do the same trip using public transport? But not just any public transport. Japanese public transport: the most reliable and, thanks to the famous 186mph Bullet Train, the fastest mass transit network in the world. As we said, the Nissan GT-R is clearly quite a car. But then, against that sort of adversary, it needs to be. 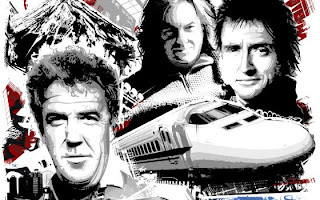 The new series of Top Gear kicks off at 8pm on Sunday June 22 on BBC Two." I think the Shinkansen wins.